The Beauty Scoop! 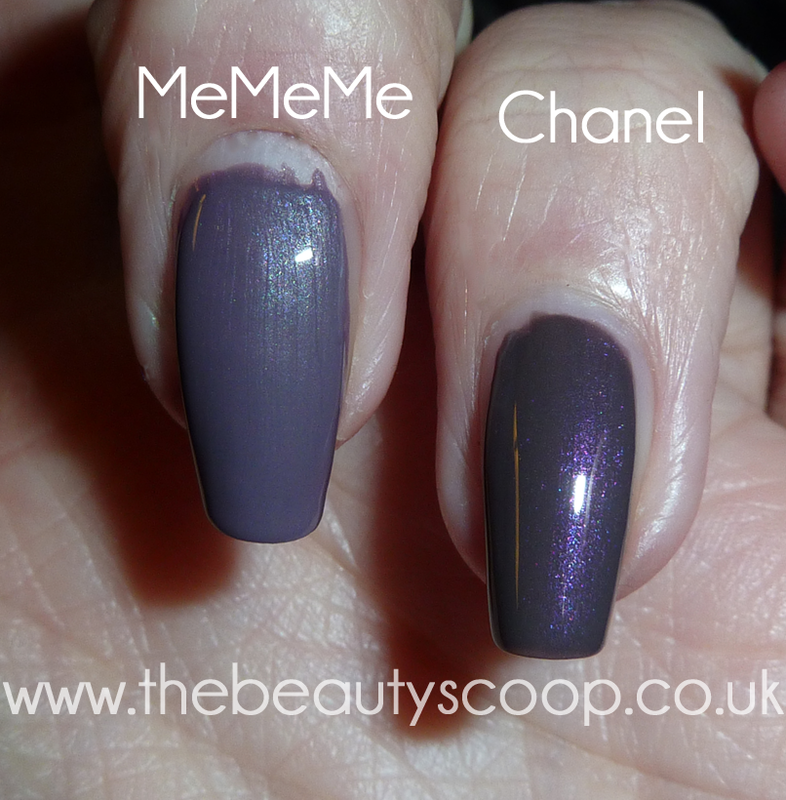 : New MeMeMe Nail Polish Shades - Part 3, 84 Delicate! New MeMeMe Nail Polish Shades - Part 3, 84 Delicate! 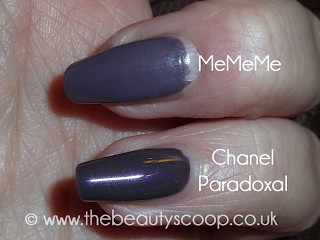 Last, but by no means least is the lightest of the 3 shades, shade 84 ‘Delicate’ which is a grey/purple shade... it has a very slight hint of Chanel’s Paradoxal polish but I think it is lighter than I remember Paradoxal being (I haven’t worn it for a while) so I wouldn’t say it was a dupe at the moment, but I’ll put a comparison up in this post (below) just to make sure. This polish seems thinner than the other 2 MeMeMe shades (and Paradoxal for that matter) and needs a good 3 to 4 coats (the swatches show 3) but it’s worth it as it dries very quickly and is a very lovely colour indeed. It looks like it has a bit of understated shimmer running through it, again like Paradoxal does (although it looks a bit more frosted to me, in the photo's) but I still don’t think that this would qualify it as a dupe. Sorry it's so picture heavy, it's just it looks kind of different in each one to me... also excuse my nails/hands etc as they're fresh from DIY'ing! Anyway, comparisons aside this is a colour that is well worth a purchase whether you own Paradoxal or not. I think MeMeMe have triumphed with these shades and look forward to seeing any more that they come up within the future. 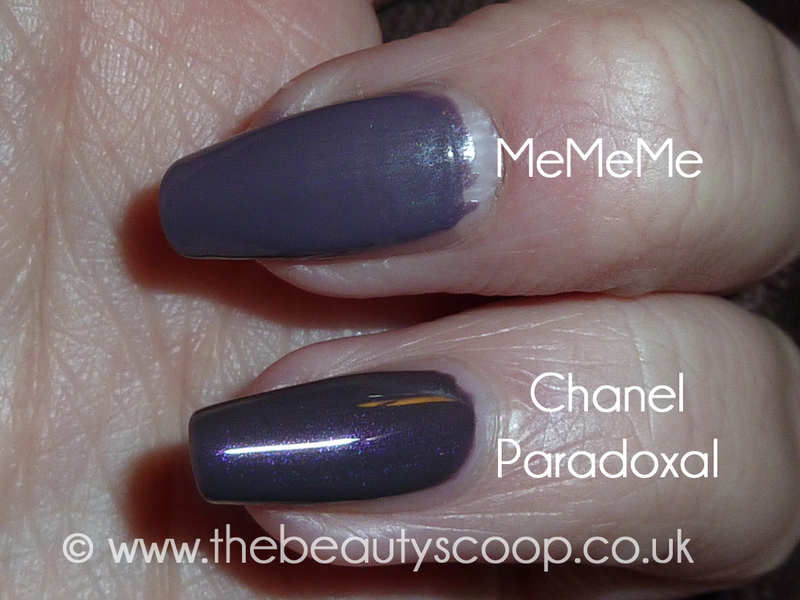 I was the same with this shade, it looks so different in different lights, almost two different polishes all together! Have you tried Barry M's Dusky Mauve? It's similar, but MeMeMe has more purple to it, and is a much better application and end result.